In downtown Toronto there is a hotel and reception facility called the Windsor Arms Hotel. Capable of seating up to 500 guests in their large and ornate reception hall you can have this be your all in one wedding location. 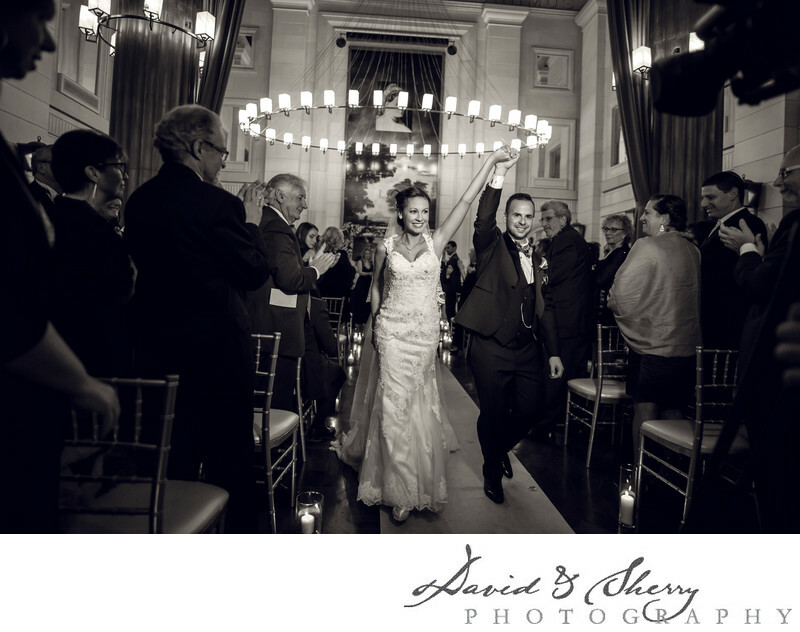 In this photo we are using the video light on the camera of the cinematographer as we both walk together down the aisle backwards trying very hard not to walk into anything or trip over anything. I love this moment when the bride and groom have raised their arms as they have said I do to each other and have said their vows, had their Rabbi blessings and the bride has walked around the groom 7 times, the glass has been broken and the first kiss together as a married couple has been shared. Weddings like this are always emotional and it is our privilege to be there capturing each and every moment that is important to the bride, groom the parents and the bridal party. We would love to be your Windsor Arms wedding photographers for your large or small event held in this beautiful space. Location: 18 St Thomas St, Toronto, ON M5S 3E7.